Another story in the Bible that leads me to believe selective salvation is not true is the story of the rich young ruler. In this story a rich young ruler asked Jesus about what he must do to inherit eternal life. 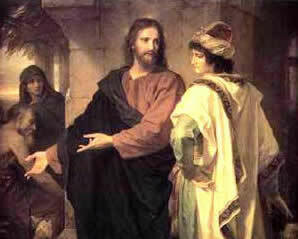 After Jesus tells him, the rich young ruler leaves in sorrow; the price was too great. According to selective salvation, God hates all of those who are not part of the elect. Yet, we find just the opposite in this situation. Mark 10:21 says Jesus "loved" this rich young ruler. Here we have a situation where Jesus loved a person who was going to Hell. If selective salvation is true, why did Jesus love one of the non-elect? Listed below are some comments concerning God hating the non-elect.